Among the legion experimental multi-media drawing methods available to adventurous artists today, one stands out as being particularly compelling and powerful. 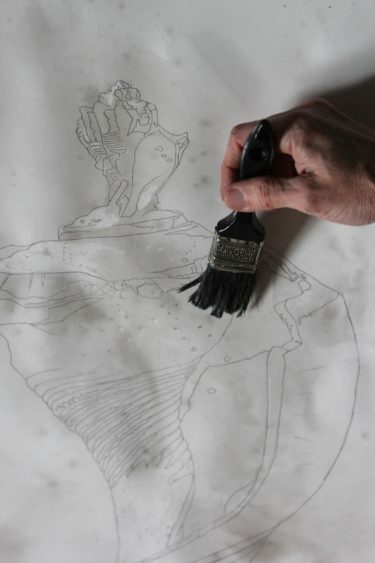 Known as the ‘wax-resist’ process, its basic premise involves using wax as a stop-out for subsequent ink washes, the wax acting as a type of frisket to protect the lighter areas of the drawing. The core concept is well known to various crafts; batik fabric dyeing is a perfect example, and children utilize the principle in stopping-out and then dyeing Easter eggs. The concept of utilizing wax in drawing has been much more limited; Henry Moore used wax as a resist in his haunting drawings of figures huddled in the Tubes during the Blitzkrieg in WWII. Along the same lines, John Singer Sargent was known to keep a clear crayon in his pocket to stop-out light areas of his watercolors. While these artists utilized the concept of wax as a resist for subsequent aqueous washes, none of them developed the technique in any systematic way. This was left to David Dodge Lewis, an artist from Maine, who, familiar with Moore’s drawings, began formalizing the process in graduate school in the early 1980’s. Drawing upon his experience in printmaking and the discipline it demanded, Lewis evolved a way of working-up a drawing with wax in discreet stages that yielded results that were energetic and powerful. 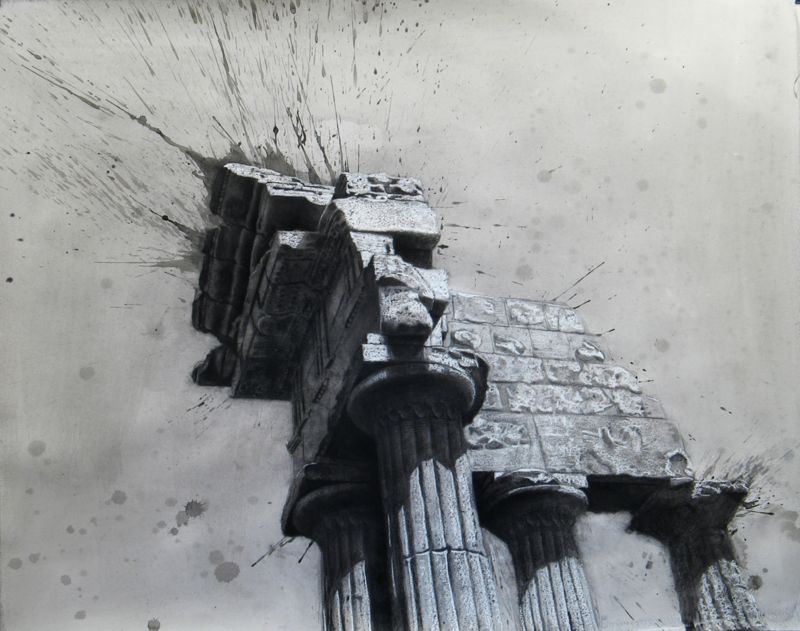 Lewis’ ‘wax-resist’ works defied distinction; they were paintings and drawings at the same time, utilizing dry materials (graphite, wax, charcoal, Char-Kole, and conte) as well as aqueous materials (ink wash and Char-Kole activated with water) in a fashion neither completely painting nor drawing. The work challenged categorization. I first encountered Lewis’ work in the late 1980’s when we both accepted teaching positions at Virginia colleges, David at Hampden-Sydney College and myself at University of Richmond. David had an exhibition of his work at HSC and he had a brochure made up, that he sent around to all the art departments of Virginia colleges. Twenty-five years later, I can still remember walking into the mailroom, pulling out the brochure from my box and being immediately stunned by his works. I had never seen anything quite like them. I contacted David, who was very gracious and invited me down to Farmville to look at his work and to walk me through the procedure in his studio. This initiated an over two decade-long collaboration, refining and expanding the potential of the process. The most recent fruit of this collaboration is “The Quickening Image” exhibition at the Washington County Museum of Fine Arts in Hagerstown, Maryland. One of the difficulties with mastering wax-resist drawing is that it not only combines many different wet and dry materials, it demands very different types of skills. You need to be able to work from observation but also invent in an abstract way; it requires you to be methodical as well as spontaneous, and you need to be able to plan carefully but also react on the spur of the moment. Process illustration 2: First layer of wax. Lewis uses a good quality white printmaking paper—in this case, Stonehenge- but it could be done just as easily on a good hot-pressed watercolor paper. 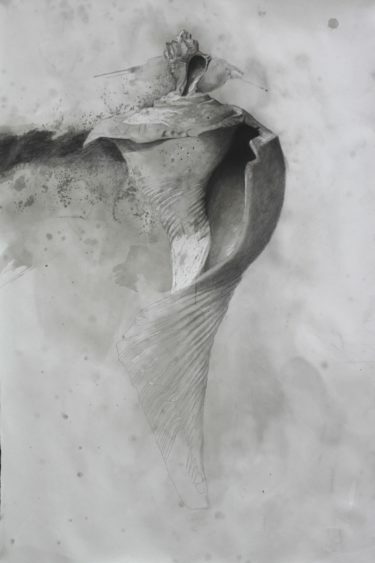 He begins with a strict linear contour drawing of the shell in graphite. This acts as a sort of map, telling him where the lights and darks will be, and particularly where the wax is going to go. 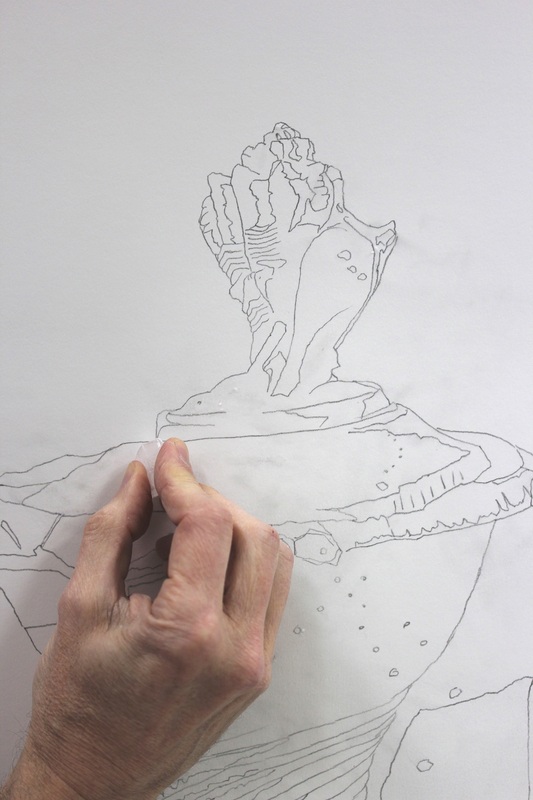 The contour drawing needs to be emphatic enough to stay visible after multiple washes of ink and charcoal. (Illustration # 1). 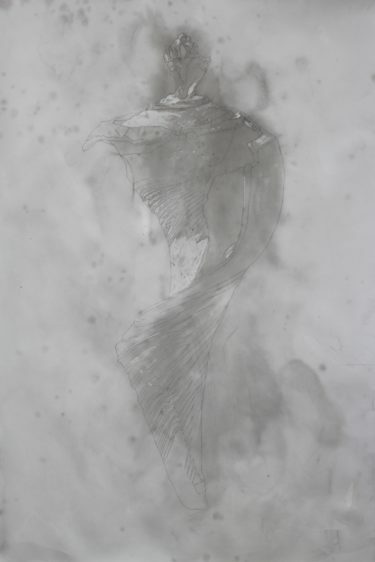 He then identifies the areas of the drawing which he will want to remain the white of the paper, and he draws over them with a piece of the wax, used as a sort of invisible crayon. (Illustration # 2) We typically use Gulf wax, a paraffin used in canning, and easily available in the supermarket. It comes in a rectangular block, which you can cut-up into smaller pieces with a knife. 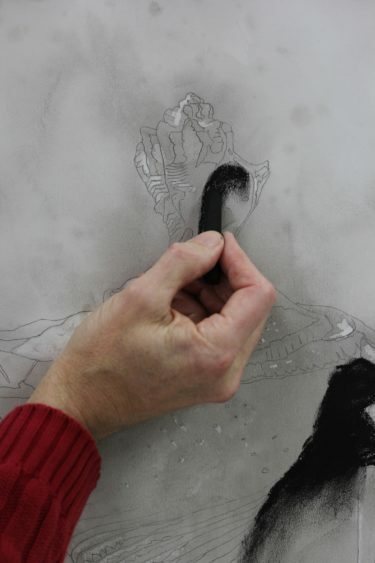 His hand demonstrates the scale of the drawing; wax-resist is most comfortable being used on a larger scale. This paper is 40” x 26”. Several of my drawings in the exhibition are as large as 60” x 40”. If you have trouble remembering where you put the wax, you can hold the paper at an angle to the light and the waxed areas will have a noticeable sheen. He then wets the paper with clear water, so that the ink wash will be consistent. 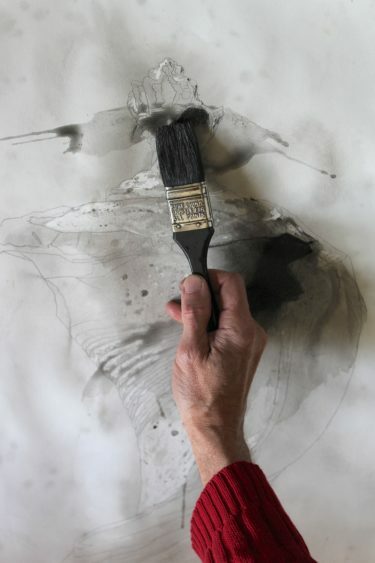 He then brushes the paper with a light gray ink wash, and the places where he put the wax will remain white. (Illustration #3) It is extremely helpful to put the drawing on a horizontal surface for the wet parts, so gravity does not automatically pull all of your washes down. Also, depending on where you might want some drips or splashes, it may be necessary to walk around the drawing, attacking it from different sides. After the paper dries, he again uses the wax to protect the areas of the drawing he wishes to remain light gray. (Illustration #4). He then wets the paper, and introduces a slightly darker ink wash. This process of stopping out and putting down ink washes can be repeated as many times as you wish. Most of our drawings have two or three stages of waxing, some have as many as six, while others have only one- it all depends on the drawing. After working together on this process for over twenty years, we felt we had not only built up a considerable body of work executed in this way, but that we had reached a clearing from which we could survey what we had accomplished. “The Quickening Image” is evidence of what we saw from that vantage point. We used the word quicken to highlight wax resist’s unique ability to animate- to energize an image and allow it to come to life. The goal of the exhibition was not only to present the work itself, but also to tell some important stories about what we had done. Firstly, it is the story of a radically new- and difficult- drawing process. Wax resist drawing is physically demanding because of its scale and because one frequently executes the dry parts on a vertical surface, such as an easel, but the wet parts on a horizontal surface, like a table or the floor, and one must continually move back and forth between the two. But it is conceptually demanding as well, in that it must be worked-up in discreet stages, which must be carefully planned for. 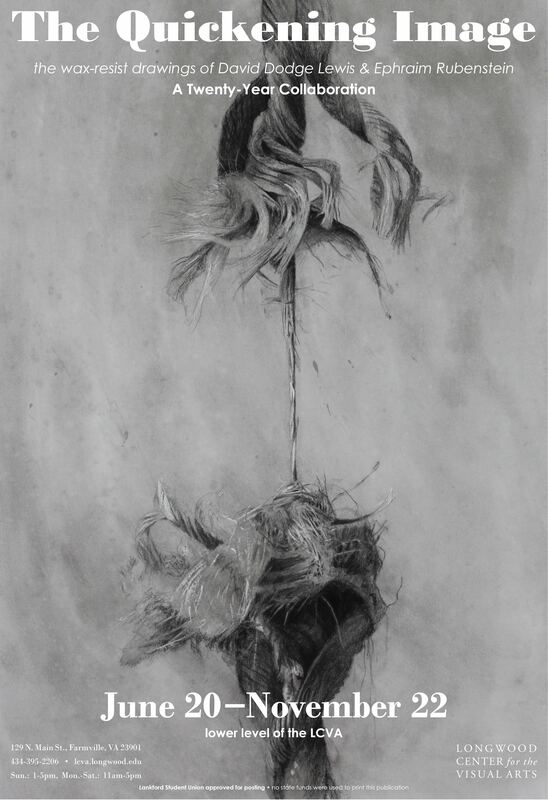 In addition, wax resist drawing derives its power from juxtaposing and resolving many contradictory tendencies: the drawn and the painted; the careful and the spontaneous and the planned and the accidental. Secondly, “The Quickening Image” tells the story of a number of historically marginalized tendencies now given center stage: it is drawing, but on the scale of, and with the impact of, painting; it is epic work, but in black and white rather than in color; it is on paper rather than on canvas; and for drawings that are so animated, its subjects are often inanimate objects. Thirdly, it is the story of a collaboration. David began using paraffin wax in large-scale works in the mid 1980’s. By the early 1990’s, he was offering workshops in his wax resist process, including ones at the University of Richmond in Virginia, where I observed it in the company of my students. With David’s help, I spent the next twenty-five years adapting the process in order to exploit its potential for my own uses. At the time, I had no idea that David’s process was going to give me a key to unlock a very different part of my work, a part that was hidden by my training up until that point. I had been schooled in a very classical, controlled, observational manner. 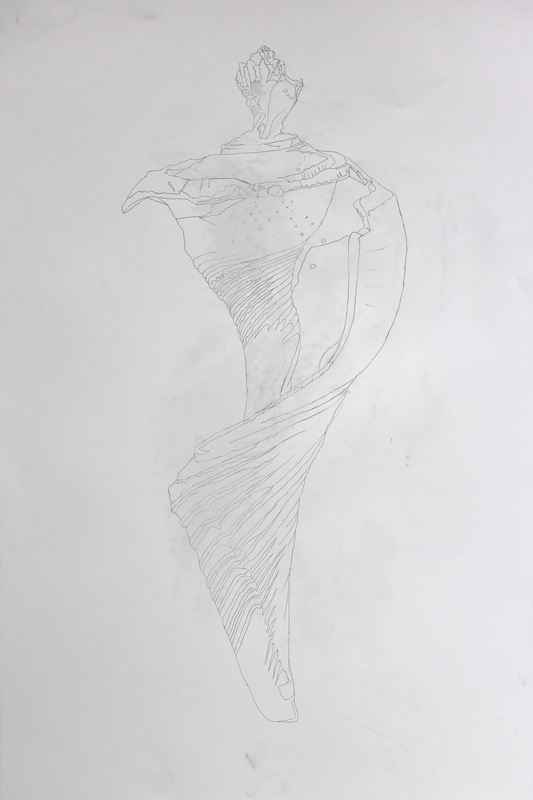 David’s work allowed me to be much less confined to looking at the subject; I started looking at the drawing as much as my subject. I began looking at the paper just as carefully as the subject, and started utilizing a new vocabulary of marks- drips, splashes, pools and puddles that had been taboo in my earlier training. I, in turn, expanded David’s initial take on wax resist drawing by treating the image more like a classical window out onto reality, with its implied floor plane and cast shadows. I was much more interested in concrete, tangible space, rather than the amorphous, indeterminate space in which David’s objects appear. And finally, it tells the story of a friendship. When artists were members of guilds and worked more collectively, there was a continual transference of information, both technical and aesthetic. Eventually, artists became much more isolated, and it became rarer for them to learn so intensely from each other. In order to do so successfully, there has to be a level of mutual trust and respect that is unusual in our time. I am continually amazed at how open and generous David has always been with his time and knowledge, and I have, in turn, taught the process to any and all of my students who have been interested. Originally published June 2015 in Drawing Magazine.View all 21 works in Temples & Cathedrals.